So been super slack on the lyrics front of late but for good reason as I’ve been house hawkin’ at a load of record fairs over the last month! These included the Hackney Record Fair where I was reppin’ with Ransom Note releases and totes along with the second-hand hauls plus the 20/20 Vision Saturday social in hip Hoxton haunt The Lion & Lamb where I brought a few of my choice crates early doors. Also was at the controls of last month’s Ransom Note Record Fair which played host to the usual vinyl vendors including choice comp curators BBE, haute house vendors Vinyl Underground, Manchester mogul Irfan Rainy City plus indie labels From The Depths and South London stable Ears Have Eyes – ran by Ransom Note’s very own Joe Europe! Scott’s the main source of my Italo inventory (and other killer kuts) so it’s only right I do a lil’ House Hunting tribute and hear his story… Scott got into records by watching old DMC clips on YouTube with DJ Shadow's opus 'Entroducting' a significant influence – he always wanted to be that killa kutz type DJ who’d just rip on wax. Turns out he had work to do when he lost a DJ comp in his second year of uni to some guy awkwardly beat juggling Beatles tracks – as you do! The hurt was deep but not for long, because he was hooked on a new drug: diggin’ and flippin’ through the 12" collections of some new friends he’d fallen in with at school. Some of the choice cuts they rocked set the direction of Scott’s tastes and collecting from then on whether it was Windy City Trax wax like Ron Hardy’s ‘Sensation’ and Sweet D’s ‘Thank Ya’, the Italo flow of Klein and MBO's ‘Wonderful’ and Fun Fun’s 'Color My Love' plus some Hi-NRG histrionics in the form of some Bobby O sleaze. Also at the time they somehow got their school to sponsor and support DJ’s playin’ in their remote town of Ithaca, NY which included Dance Mania mainstays and Juke heroes Traxman, DJ Spin, DJ Rashad, DJ Deeon and DJ Clent playing all their Juke joints to Scott and his 11 housemates – proper private party! The ensuing years at uni Scott stepped up his collecting game which was fast-becoming the biggest and most rewarding thing in his life then it was game over when he hit NYC for grad school as he rinsed all his student loan on records – we’ve all been there a sound investment! He hooked up with Phil Lembke (aka DJ Sticky Dojah), Dan ‘Diz D’ Doct’rin’ outta Montreal and Noah Freeman who were all major influences and no doubt helped him securing a spot on WNYU 89.1 with his live mix show ‘Bodyshine’ which was the perfect platform to showcase his skills as a serious selector. After meeting Jeff for the first time and exchanging info back in the Autumn of 2015 they didn't hang out for months but during that time Scott got his dream gig as he secured a position at a new record shop in town. The record store job more or less brought ‘em back together in a way; Scott would talk about the job with Jeff and what he was stocking and they’d dig there together and with Jeff turning Scott on a load of sleeper scores. They also hooked up at Scott’s spot a few nights each week, staying up way too late to spin, trade and talk records. They had similar ambitions, ideas, and ideals for how the record game in St. Louis could go and then, on a cold winter’s day their talks about about "what are we doing with this records thing; where's it going" began. Not long after these late night sessions, Scott began to realise that the direction the record store he was behind the counter at and what he and Jeff envisioned were irreconcilable, so he jacked the job at the shop. With his new-found free time and an something of an insight into general business practices, Scott and Jeff began to think increasingly about the "what if?" scenario. Then, one morning Scott received an early morning phone call from Jeff. He hit him up to say he had quit his job and was ready to dive in to realise their dreams. Without skipping a beat Scott started scouting cheap locations. Whilst on the prowl for prime shop space they jetted on short buy/sell daytrips and pop-up sales to raise funds, and eventually found a nice basement location on one of the the fastest developing streets in St. Louis. Having found their basement treasure trove, they began the process of turning the diggers dwelling into a legitimate store. 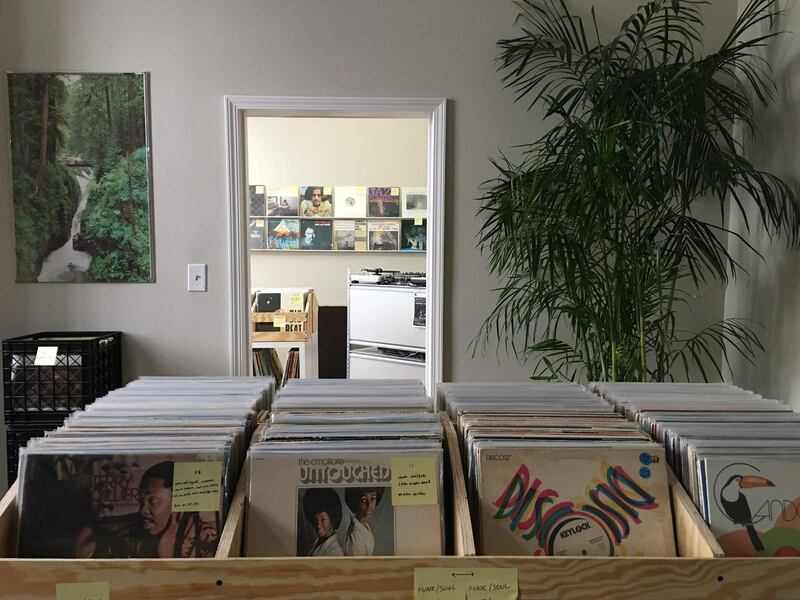 All said and done, from paper work to painting, Endless Planets opened its doors for the first time on April 16 last year initially stocking the store with records from their personal stashes. Fast-forward to 2017 and they’ve left the subterranean charm of their basement abode, and upgraded to a bigger space with a superior interior just a few blocks down the road from the old shop. With the newly gained visibility on the local level alongside the support of some major international players in the record game, they’ve been digging deeper and farther than ever before – last November they jetted north of the border to Canada between Toronto and Montreal, selling and buying at public and private digs as often as they could. Their main goal is to keep the store stock impeccably curated - never buying lots, just cherry-picked cuts and handpicked hauls. To begin let’s rewind to the early eighties where a primitive demo of Jamie’s classic Chicago cut ‘Your Love’ had been circulating on tape for a couple of years. As opposed to the primitive productions that were synonymous with the emergent house scene of the city, Jamie’s opus was much more of an artistic arrangement with a more European feel akin to Italo and new-wave. No doubt that the track’s styling was inspired by his youth… Born Byron Walton, he grew up in a strict Christian household where any form of dance music was considered secular and was forbidden. However, his roots of being a classical drummer in a church choir laid the foundations for his love of music with influences and inspirations including David Bowie, Depeche Mode, Heaven 17, Parliament, Prince and Visage – all of which you can hear in Jamie’s early records including ‘Waiting On My Angel’, ‘Your Love’ and ‘Baby Wants To Ride’. Preceding the release of ‘Your Love’ was this week’s wax ‘Waiting On My Angel’ that was released on Danny Alias and David Bell’s Persona Records in the Spring of ’85. 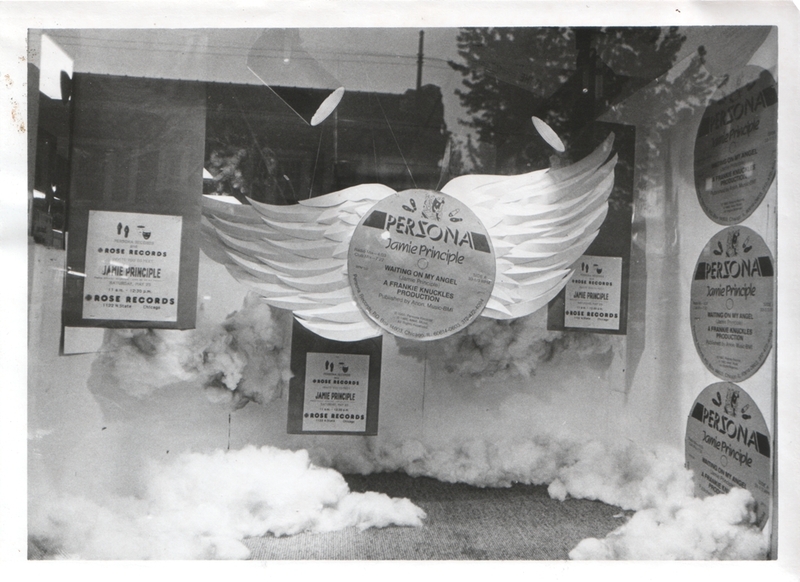 Persona had just been launched the previous year to release the New Wave styling of Danny’s Cold War cut ‘Civil Defense’ featuring unsung Chicago House hero Brett Wilcots (who was behind the counter at Chicago Institution Importes Etc. and later of Gherkin fame) turning in his first ever mix resulting in a proto Chicago house dub loaded full of lasers, schizoid synths and war sirens blazin’ out – finding favour with Chicago’s DJ deity Ron Hardy who rinsed it at the Music Box. You’re lucky if you can cop a copy for under a ton so seek out the respectful reissue that Ransom Note’s enfant terrible Ivan Smagghe gave the record last year on his Les Disque De La Mort label complete with re-edits from Ron Hardy and Ivan himself! You know me though I’m still hunting down the original pressing complete with Republic Disco sleeve anoraks anonymous… Anyway, there was a release party for the record at the legendary Seagrape Studios where Brett Wilcots and Frankie Knuckles were instrumental in getting Jamie signed to Persona. On hearing the demo of ‘Waiting On My Angel’, Danny and David approved so added a bit of polish and promotion to make it a finished product. It was an overnight sensation and was the first Chicago House record to enter Billboard Magazine’s ’12 Inch Singles Sales’ charts peaking at number 40. Though 5,000 copies were pressed up, demand outweighed supply as the pressing plant couldn’t keep up with the 1,000+ copies sold per day in Chicago alone – kids were lining up on the street and around the block to cop a copy! Now it wouldn’t be Chicago if there weren’t a twist in the tale that’s pure wild Windy City Mid-West… Legend has it that Larry Sherman was courting Jamie to release ‘Waiting On My Angel’ on Trax but aware of his dubious business practices Jamie passed him up. Larry was so p***ed that he opted to sign to Persona instead of Trax that as well as blocking the distribution and sabotaging the record in any way he could (including his usual shady practice of pressing up extra copies as he wrangled the rights despite Masterdisk in NYC pressing up the original) he got Jesse Saunders and Vince Lawrence to record and release a cover version. Larry played on that there had been some history between Jesse and Jamie (Jesse used the sequenced synth pattern off Jamie’s ‘Your Love’ for his hit ‘Real Love’ so though technically not falling foul of copyright law naturally Jamie felt ripped off) so Jesse should side with Larry as he’d been spited by his new enemy. Jesse obliged and when he was credited with the release of course Jamie assumed he was stealing again – though it was Larry who masterminded the whole operation.